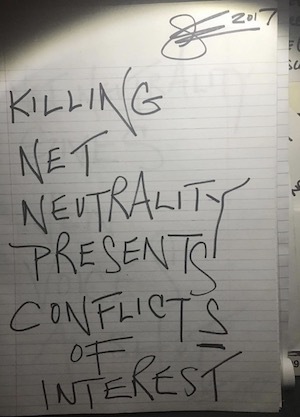 Please scroll down to read words on Net Neutrality by Jennifer Elster and Gloria Steinem from December 2017. An important time, as any so far, to donate to Stacey Abrams. "Kicked back with Bobby Joe on the back roads, talking history of the Civil War and the Battle of Rich Mountain in Randolph County, West Virginia. Spent the day in the town where the second battle in the Civil War occurred and was won by the Union. I'm having a most incredible time, but I never lose sight that tension is tight in America. And as I always say (and many can't fathom – yet), the extreme division in this country makes another civil war actually possible." Bobby Joe and I never exchanged which political party we belonged to. And we lost a fight that will bite us for a very long time. Net Neutrality. The Senate voted to restore Net Neutrality. This is a victory. Now it's time to take the vote to the house! "The South needs diverse leadership to broaden their mentality. Stacey Abrams is campaigning to become the first female, black Governor... in Georgia! She lays it out. Her family grew up poor in the Deep South, her brother was a heroin addict and has been locked up several times, she herself has her own financial debt to the government, and yet she still managed to problem solve her way through. Stacey graduated from Yale and has been the House Minority Leader for the Georgia General Assembly for seven years. I'm giving her a hug here because I heard a woman's voice who cares and who understands how to get in there and fix social issues. I don't agree on every topic with her, but I see her as an important and qualified force to make a change for better in America. Take a moment to donate to her campaign by going to StaceyAbrams.com. Even if you give five dollars. Give to altering the nasty course we have been on in this country and #support her campaign. I did. It will make you feel better about your day." Get behind Stacey Abrams for governor of Georgia and donate to her campaign NOW. TAKE ACTION NOW: With ease call or Tweet Congress to let them know you care about our democracy online. Save Net Neutrality. Check the scoreboard for who is for and against Net Neutrality. DO NOT DELAY! Get behind Stacey Abrams for governor of Georgia and donate to her campaign NOW. I believe she has the heart and the determined ability to make an important difference in the South. This is the immediate type of change that is needed. Protest and Tag #OneMoreVote on February 27th online. Call Congress at the US Capitol Switchboard at 202-224-3121 (an operator will connect you directly with the Senate office you request). Text MISSION to 384-387 to contact Congress and stop the FCC. Visit your lawmaker’s office sometime between 12:00pm-1:00pm on February 27th and encourage your lawmaker to be an Internet hero by supporting the congressional effort to save Net Neutrality. Sign petition for Congress to use the Congressional Review Act to overturn the FCC's repeal of Net Neutrality. The Federal Communications Commission has repealed Net Neutrality. Congress can still overrule this FCC vote!! Do not lose endurance. Call Congress at the US Capitol Switchboard at 202-224-3121. An operator will connect you directly with the Senate office you request, or text BATTLE to 384-387 to contact Congress. Gloria Steinem and I have come together to stand up for Net Neutrality (read below). What is Net Neutrality? 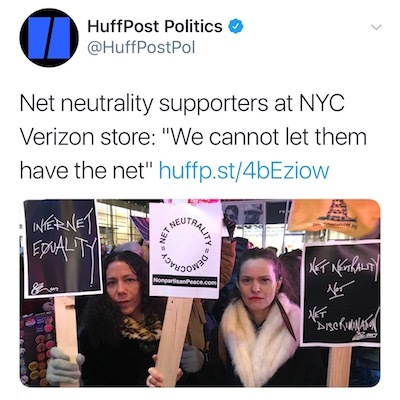 Net neutrality is the principle that ISPs (Internet Service Providers) like Comcast, AT&T and Verizon must not discriminate or favor any particular content, website, platform, application, type of attached equipment, or method of communication. Internet service providers are prohibited from intentionally blocking, slowing down or charging specific websites, and online content to reach consumers faster. Gloria and I have written the following text, suggest the following actions, and hope you will take this topic as seriously as we do. Act now – and come back tomorrow for more information. "A suggestion: Call the Republican Senators and ask them to tell Trump to #toneitdownwithNorthKorea"
You can contact your Senators here.